After all of the excitement this past week, you might think there is nothing left to do in Wausau, but that would not be true at all, of course. There is a Concert in the Garden at the Leigh Yawkey Woodson Art Museum tonight at 6 pm. Johnny and the Mo-Tones play the square tomorrow night. And the Frisbee Dogs strut their stuff at the Riverfront Marketplace on the 400 Block on Thursday at 11 am and 1 pm. But wait! That’s not all! It is not a big fun event like a concert, but the Good News Project is recycling computers once again this Friday. In case you don’t know, you don’t want to just pitch out your old electronic stuff for two good reasons. First, when that kind of stuff gets in the landfill, all kinds of metals and other toxins leech out and we don’t need that in our water and ground. Second we don’t want have to mine more of those metals — that is toxic to the environment too. So you know it is a good thing to do for the good of good people, or something like that. Here is some more detailed information, courtesy of Tom Fladland over at Good News. Area residents and businesses can have their computers and other electronic gear recycled at the Good News Project warehouse at 1106 Fifth St., Wausau, for 25 cents a pound. Cost for a typical computer outfit of 40 to 60 pounds will be $10 to $15. Hours are Fridays, July 13, and August 17 from 10 a.m. to 4 p.m.
Community support for the computer recycling program has been so extensive that Good News is able to share some of the proceeds with other nonprofit groups in the community, according to Tom Fladland, the humanitarian organization’s operations director. Nearly two semi trailers were filled at the April recycling event. All of the proceeds from the Good News computer recycling events go to assist nonprofit organizations in the community. All material goes to professional computer recycling specialists and is processed with the environment in mind. Information on Good News is at www.goodnewswi.com. Information on the recycling event is available at 843-5985. Anyone bringing more than 20 pieces of equipment is asked to call in advance. If you don’t have any computer equipment that you don’t need, perhaps you have some time and money on your hands. If so, perhaps you would like to have some fun for charity. That’s right, fun for charity. The North Central Wisconsin Donate Life group is having a “scavenger hunt” on Saturday, July 14. This group’s purpose is to increase awareness of organ donation, which sounds like a worthy cause to me. Apparently this is scavenger hunt with a twist. You don’t actually have to drag back the things that you find, but rather document your find with a digital camera. So not only will the hunting teams be looking for objects, but perhaps also places and evidence of having completed some task. Umm, “Truth or Dare” anyone? Sounds like it could be a riotously good time to me. You can check out their website for more information and to register for the event. 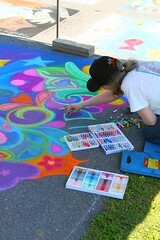 This year’s Chalkfest had a colorful, but short run this year. The rains came Sunday night and smudged out most of the work. But before the rains came I had the handy Canon there to capture a few images, which are over on the Flickr page. Enjoy. This has been such an amazingly busy weekend, packing a months worth of events into one weekend. I have been pretty busy trying to keep up with things, so on the ballon rally I will let the pictures speak for themselves. Check them out on the Flickr page for the blog. 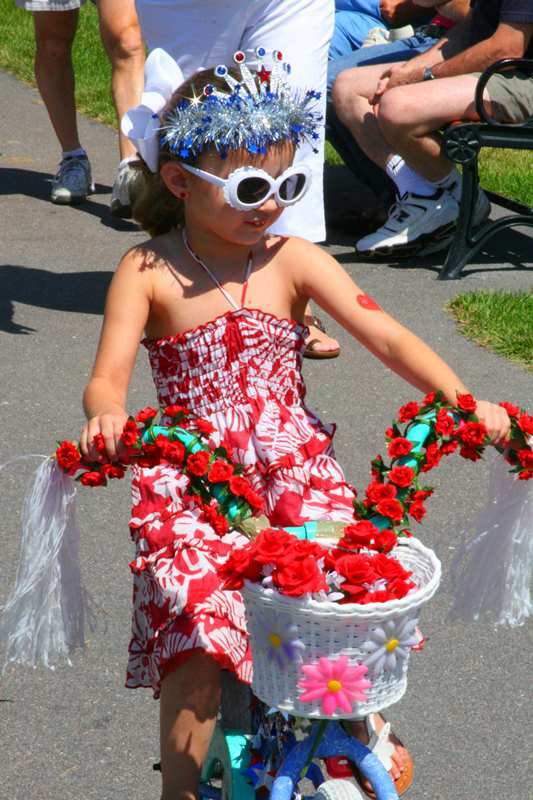 See you at the airport tonight for the Flying Elvi, balloon launch, balloon glow and then fireworks. Whew! 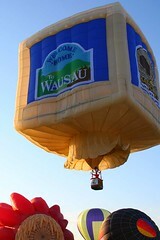 There is just a ton of stuff going on this weekend in Wausau. In addition to the Jaycess annual 4th of July Celebration we are also having Balloonfest, with the new BBQ ribs contest and Chalkfest. Wow. Things got kicked off on the square with a kids parade and City band concert. I have a teaser shot here and the rest are on the Flickr site. 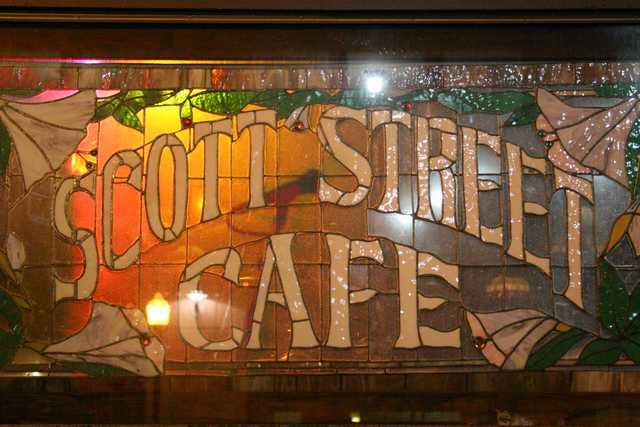 The Scott Street Pub may be gone, but apparently it is not forgotten. Judging from the comments here and over on the Herald forums, if nothing else the Pub does get a response, both good and bad, which is appropriate for a live music venue that got a little long in the tooth. With such a place sometimes it is hard to separate the building from the ownership from what actually happens inside. All three acquire their own mythology which intertwine. One part of that mythology is that the Pub was not a genteel place. It may have been a peaceful place, as Tom Bergs said as the Pub was being shut down, but it was by no means some kind of upscale jazz club. Although musical groups from all across the musical spectrum played there, it definitely had a gritty rock ‘n roll atmosphere. And I am talking the axis that went from honky-tonk to punk here. At least in part, it was this mythology that lead to the police presence on Saturday night. Apparently rock remains dangerous music, even if the Pub itself was not a dangerous place. But all that now passes into history. A history, like all histories, that deserves to be remembered and preserved. For many years the Pub was part of people lives and part of our city, and their are stories to tell and remember. I would like to do my part to see that that happens. 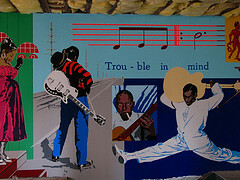 The first way is to preserve and hopefully display the mural on the second floor. I had an opportunity to speak briefly with Tom Bergs on Saturday night and he said that he would very much like to see the mural preserved, so we will continue working on that plan and see what we can do. Preserving a mural that covers the entire wall of a 100 year old building that is slated for demolition will be no easy task, but I think that Wauvillians are up to the task. Stay tuned for that. The second way came to mind as I made the video on Saturday night. How about a little oral history project? If you have been involved with the Pub, as a musician, employee or patron, and would like to share your memories (and mythologies) of the place with the world, shoot me an email. If you are willing, you can talk a few minutes into the camcorder, and then we can put your memories here on the Wausaublog. I know some folks with long memories are reading this, so let’s get together and save a few of those stories and share them with everyone. Or at least hopefully share them. The camcorder I borrowed to shoot video on Saturday night used dual layer DVDs. But it turns out I don’t have a dual layer DVD drive on any of my computers, so I can’t get the video off the disc and onto the web. If anyone has a dual layer drive that can help out, fire me an email. Twenty years of live music at the Scott Street Pub did not end in a blaze of guitars and drums, but rather in a blue bureaucratic haze. Before the headline band of the night, and the final act at the pub ever, could take the stage, the Pub was already closed. City police arrived in force at about 12:15 to inform Tom Bergs that his liquor license had exprired at midnight and the being in violation of the law, they were clearing the out the place and shutting down the Pub. In a bit of quick improvisation, the Pollack Inn on 3rd Street was called and asked if the finale of the Pub could be held there. The final indignity of the Scott Street Pub is that their farewell performance had to be held in another venue. Hey thanks for 20 years of live music, Tom. One of the few positive things to come out of the incident was that there were no problems during the shutdown. 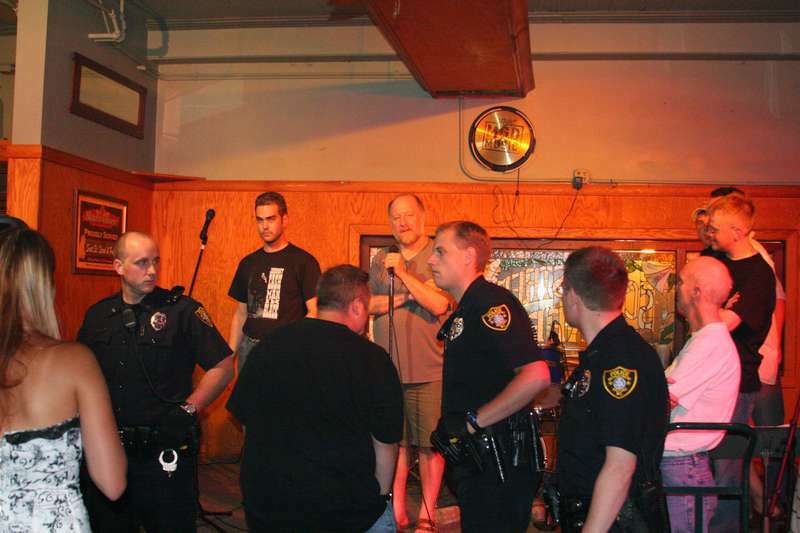 A few angry words were directed at the police, but Tom Bergs quickly took the stage, and emphasized that the Pub had always been a peaceful place, and that the police were just doing their job. Within minutes the rock ‘n roll crowd of the Pub had filed quietly into the darkened streets of downtown. What I don’t know at this point is who knew what when. Give the number of officers that showed up, the shutdown of the pub was obviously anticipated by someone at the City. It was well known that the last day of business of the Pub was June 30th, and I would suppose that the liquor license expired with the business as it were. In the bar business it would be somewhat understandable that the owners don’t think of their “business day” as ending at midnight. After all the Corpse Show Creeps were advertised as playing “June 30” even though they would not take the stage until after midnight. It seems to me that someone from the City could have reminded folks that the day ends at midnight and that limit would be enforced. Tom and the Pub have run alcohol free shows before, and perhaps an 11:30 pm “Last Call” could have allowed the show to go on. If the City was operating in “gotcha” mode, as it appeared they were, then Wausau has lost several thousand points on the “coolness” scale. More than 50 years after it appeared on the scene the City Fathers still think rock ‘n roll is some kind of plague? How backward is that? The crowd at the Pub was of all ages on the last night. Twenty something “punks” mingled with people who looked old enough to be my parents. Along with the mohawks there was plenty of gray hair. The crowd was generally very well behaved, especially when the Pub was being shut down. It is a shame that a place with such a rich tradition had to meet such an inglorious end. Eds Note: The picture of Tom Bergs taking the stage to talk to the crowd was taken at 12:18 am. I have a picture of the band that was playing previous to that which I took at 12:11 am. I have many more pictures of the final night of the Pub which I hope to get uploaded today sometime. I had taken video of the proceedings as well, but so far the disc seems to be unreadable, so it may never see the light of day.